In a series of recent posts, I summarized the very special food that is funazushi: where we had good funazushi and the history and traditions behind this special dish from Shiga. I’ll finally finish off this Shiga cuisine series for now. That is until our next trip to uncover more yummy places for funazushi and other treats in Shiga. So, the final post is about how the stinky fish is made. As you can see in the picture above, funazushi presentation you always has cheese-like fish roe or eggs in the middle of thinly sliced fish, all on the porridgey fermented rice. I am going to describe how this perfect funazushi is made in 12 bullet points. So, this is kind of an abridged version of the one to three year process of how the stinky fish is made. Te-chan edited the video from Kitashina, so I hope readers had a chance to watch the updated video with English translation and see how the veteran okami-san at the restaurant cleaned the fish. What you saw in the video is only steps two through four of what I am going to describe here. It was like magic how in a matter of a few seconds–OK, more precisely, eight minutes, to see how okami-san explains her layering the fish standing up in order to make the shape of the fish and ovaries perfectly round, not flat. It may sound rather trivial, but everyone wants perfectly shaped fish and how it is so carefully fermented is what makes it special. 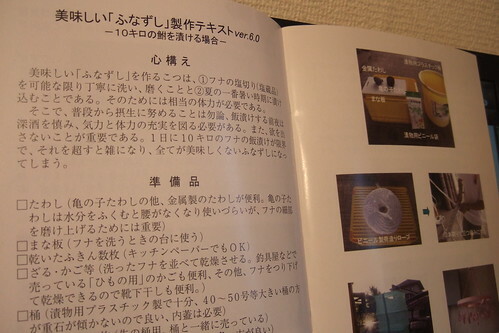 As a reference, I looked to Version 6.0 of the textbook on funazushi issued in 2007 by the Shiga fisherman’s co-op. The holy text sets your mental and physical health on the day you commence the process as essential. Also, the instructions tells you not to drink the day before you seal the cured fish with cooked rice. So, as you can imagine, we are talking about a sacred and serious business here. Between March and May, nigorobuna travels closer to the shore of Lake Biwa or other water outlets in the area to lay eggs. That’s when the fish is caught. Fish is sold on the day it is caught. Kitashina buys fish live from fishermen. Fish is cleaned first by getting inside the gills and pulling the swimbladders first. Then all internal parts are pulled out very quickly without breaking the ovary. Stuff salt firmly, then cover the fish completely with salt: about 2-3 cups of salt per fish. Funa stuffed with salt is stacked in a big barrel with more salt. The barrel is left with a weight on top anywhere from 1 month to 2 years. In the summer, cured fish is completely cleaned with water, then dried a few hours. Now, stuff cooked rice in the fish. As far as the fish to rice ratio, the textbook says to prepare the same weight of uncooked rice as the weight of fish, then cook the rice. 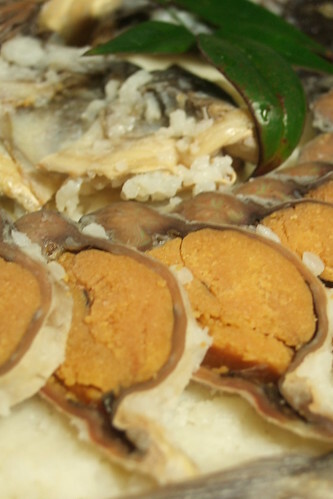 Then, the fish stuffed with rice are layered on cooked rice in an alternating stack of layers of fish and rice until the big barrel is full. Close the barrel, place a weight about double the weight of the fish. Leave it one week. Add another set of weights to make it about 3-4 time heavier than the fish. Leave it anywhere from 6 months to, in case of Kitakata, more than 3 years. The following sites with step by step pictures may be easier to grasp what it takes to make the stinky fish. How Sumimoto in Nagahama, Shiga, make their funazushi. Shiga prefecture promotional page explaining how funazushi is made in Japanese. I hope you feel you know everything you need to know about the dish, or, maybe the funazushi series was more than you ever wanted to know… In any case, I hope you enjoy the dish next time you visit Shiga! Photo: Bilingual subtitled video, previously on Making Funazushi. In Tokyo. where can I find the most authentic versions of this fare?